Building of a consolidated and integrated structural system. Acknowledging the work/functions of the organization team and staffing transactions. Building various blocks of the OM, in an expert mode. Learning to work within the predefine areas of tasks and their catalogs. Reporting of the basic organization structure. Integration of the basic components of an OM. Detail maintenance of data in the centralized structure. Learning to make efficient plans for organizational use and the concise evaluation of tools. Business analysts and project team members are the target candidates in this field. Every organization needs SAP Organizational Management (OM) experts for monitoring the activities going on in the required fields, so as to attain higher levels of productivity and profitability. Each department of an organization employs a management team for supervising, assessing and controlling the workforce in relevant sections. A supervisor is mandatory for the central reporting of the whole team. 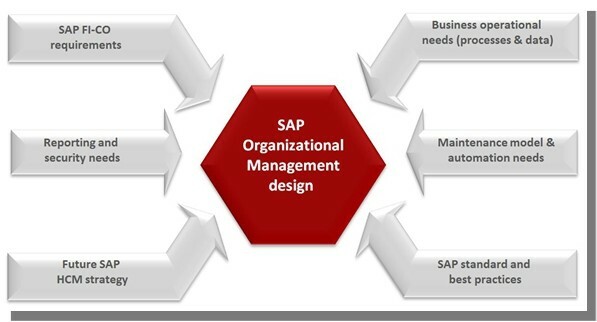 These and other related SAP business operations can be accessed with good workflow. On the whole, there is a big opportunity for people availing a course in this field, and helps them explore more and more skills. There is no specific certification provided under this course. Organizations hire consultants in this field in accordance to their knowledge and expertise in the management of organizational structure. However, SAP documentation for the following course can help candidates acquire the required knowledge, so as to score a job in the respective field organizations availing SAP applications on their floor. General knowledge about human resources and the basic structure of an organization is an important necessity in this field. Sound knowledge of SAP workflow, along with the implementation of SAP Applications will be an additional benefit for securing a seat in this field. The course contents can make the work easy for aspiring candidates to explore their skills in SAP OM.